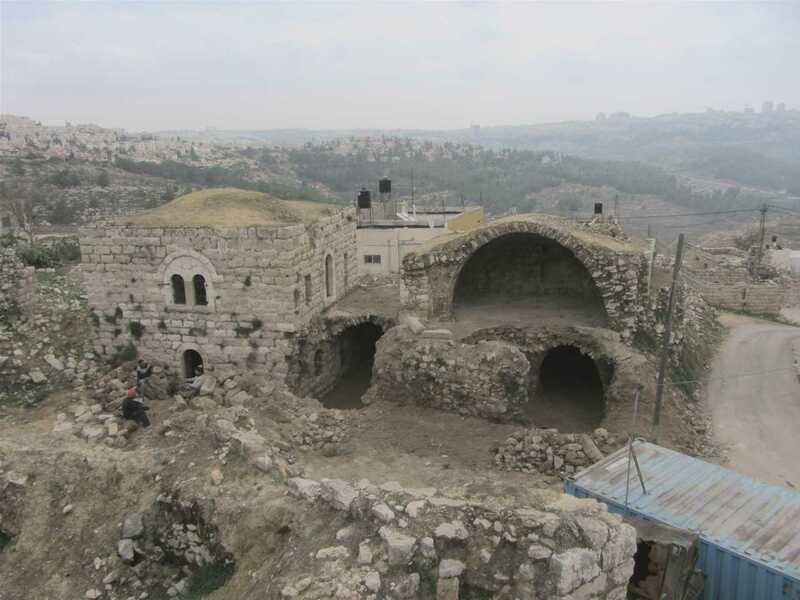 Women’s center building before restoration. Presentation of the Acknowledgement prize for “Adaptive Re-Use: Women’s center and playground, Beit Iksa, Palestine” (l-r): Amer Moustafa, Member of the Holcim Awards jury 2014 Africa Middle East and Associate Dean, School of Architecture and Design American University of Sharjah, United Arab Emirates; winners Shatha Safi and Khaldun Bshara, Riwaq – center for architectural conservation, Ramallah, Palestine; Javier de Benito, Area Manager of Holcim for Africa Middle East. Public space site before construction. Reviving the historic center of a village of 1,600 people, the project responds to isolation and limited resources. Two abandoned buildings will be adapted for reuse as working spaces with an eco-kitchen, followed by the rehabilitation of surrounding spaces. 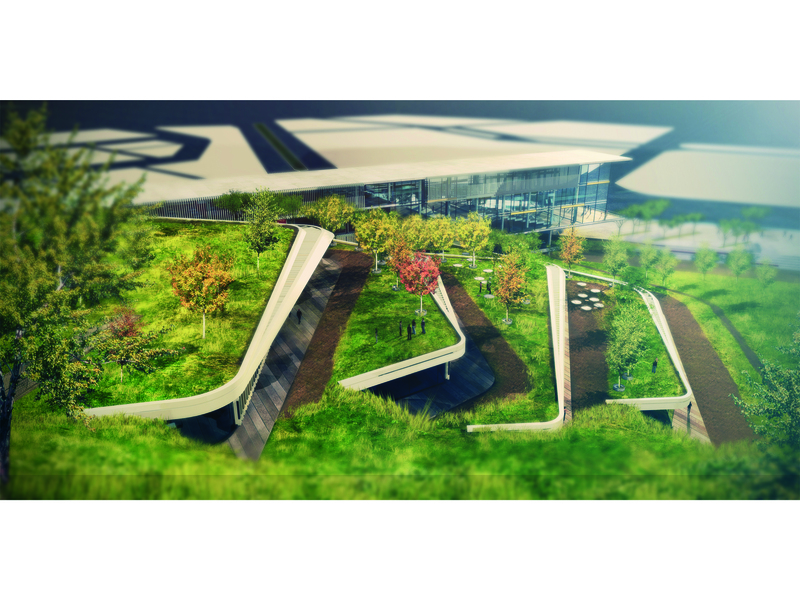 The new facilities will include interactive educational playgrounds for children, winter and summer seating areas, and a protected bird habitat – combining design, planning, restoration, landscaping, and infrastructure. 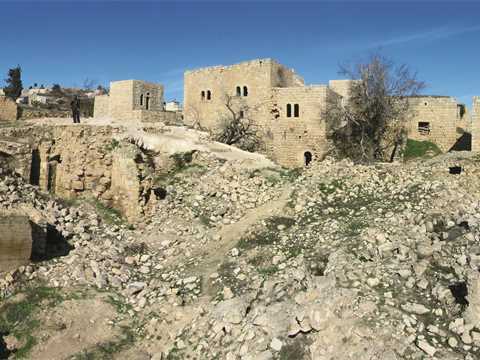 Part of a larger scheme to revive the historic center of Beit Iksa, a small Palestinian village of 1,600 people near Jerusalem, the project offers a response to the village’s isolation and limited resources. 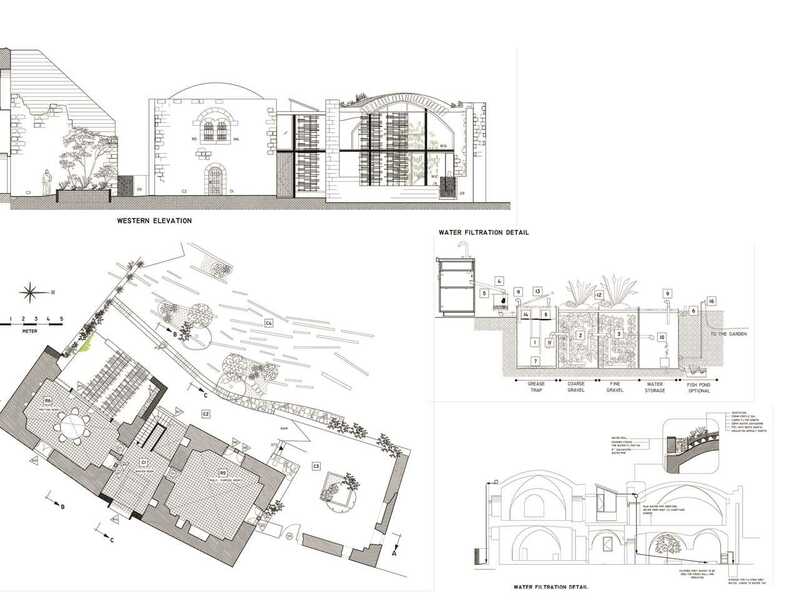 In a first step, two abandoned buildings will be adapted for reuse as working spaces with an eco-kitchen for the local women’s association, followed by the rehabilitation of surrounding spaces. 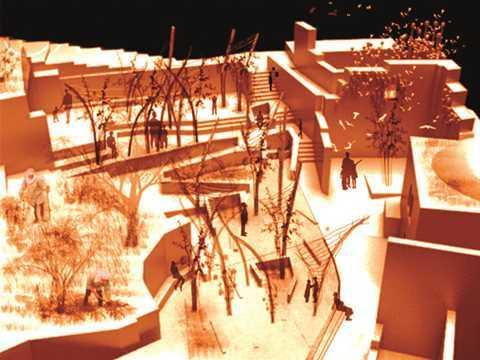 The new facilities will include interactive educational playgrounds for children, winter and summer seating areas, and a protected bird habitat. It is an effort to bring life back to this abandoned site by combining design, planning, restoration, landscaping, and infrastructure, thus improving local living conditions and biodiversity, while adding to the aesthetic quality of Beit Iksa. 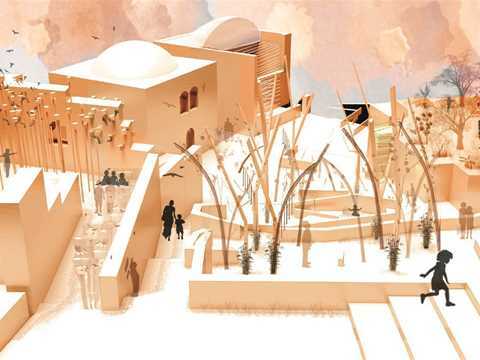 Yara Sharif and Nasser Golzari from NG Architects and Palestine Regeneration Team (PART) in London focus their project on self-sufficiency, local knowledge and social impact. 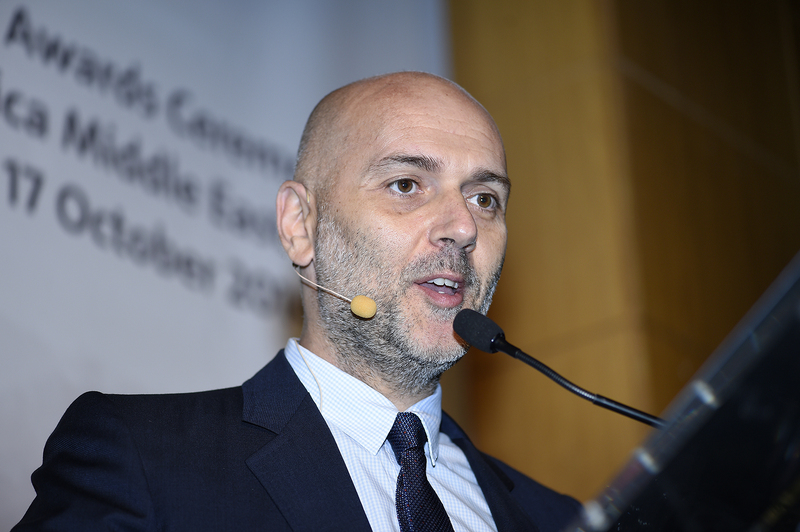 Responsiveness emerging from local knowledge and technical enhancements is at the core of their approach to sustainable construction. 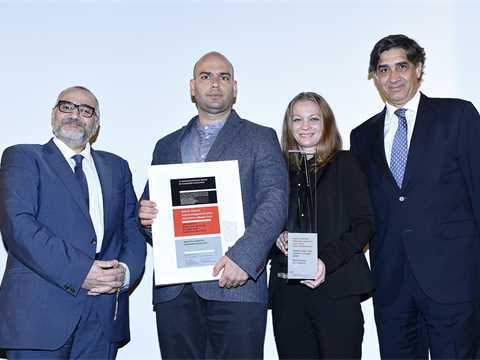 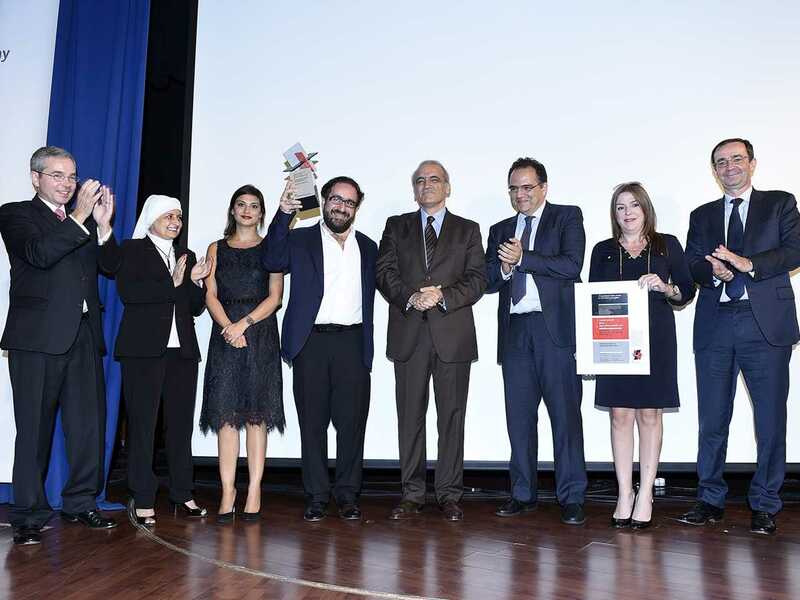 “Adaptive Re-Use: Women’s center and playground” in Beit Iksa, Palestine won a Holcim Awards Acknowledgement prize for adapting two abandoned buildings for reuse as working spaces with an eco-kitchen, followed by the rehabilitation of surrounding spaces. 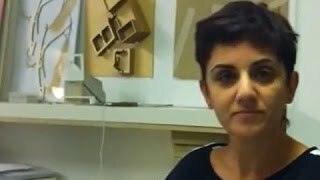 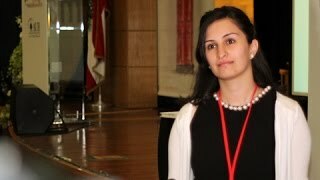 Shatha Safi from Riwaq – center for architectural conservation in Palestine considers people, material and knowledge to be the key sustainability factors of her project. “Adaptive Re-Use: Women’s center and playground” in Beit Iksa, Palestine won a Holcim Awards Acknowledgement prize for reviving the historic center of a village of 1,600 people, responding to isolation and limited resources. 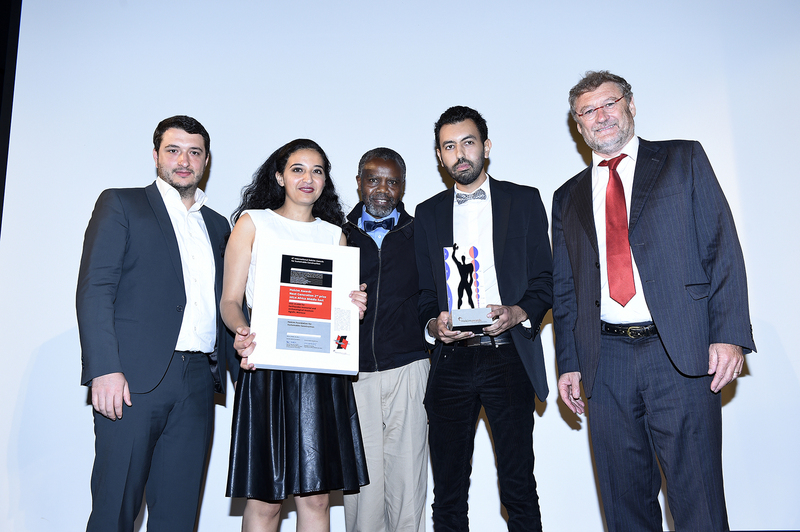 Presentation of the Holcim Awards Gold 2014 for “Eco-Techno Park: Green building showcase and enterprise hub, Ankara, Turkey” (l-r): Howayda Al-Harithy, Head of the Holcim Awards jury for Africa Middle East and Professor of Architecture, American University of Beirut, Lebanon; Javier de Benito, Area Manager of Holcim for Africa Middle East; winners Onat and Zeynep Öktem, ONZ Architects, Turkey; and Bernard Fontana, CEO of Holcim Ltd. 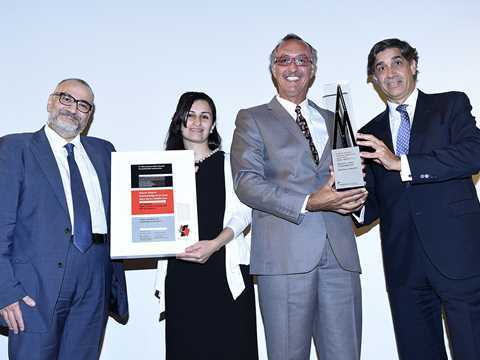 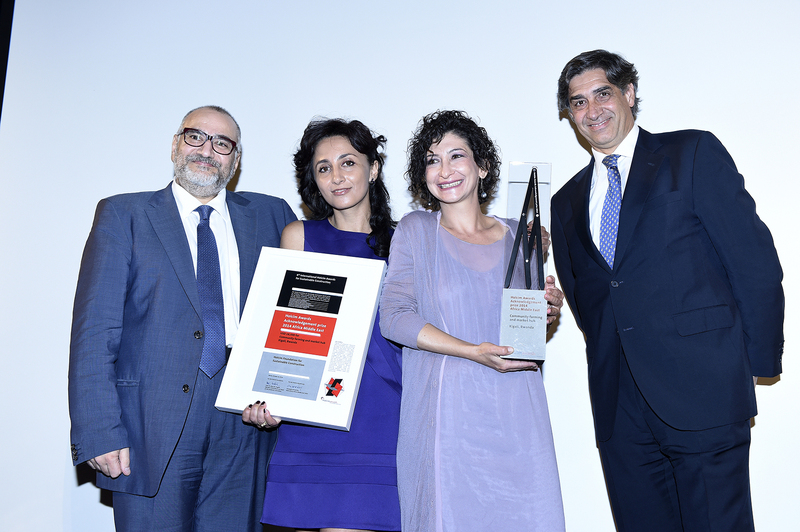 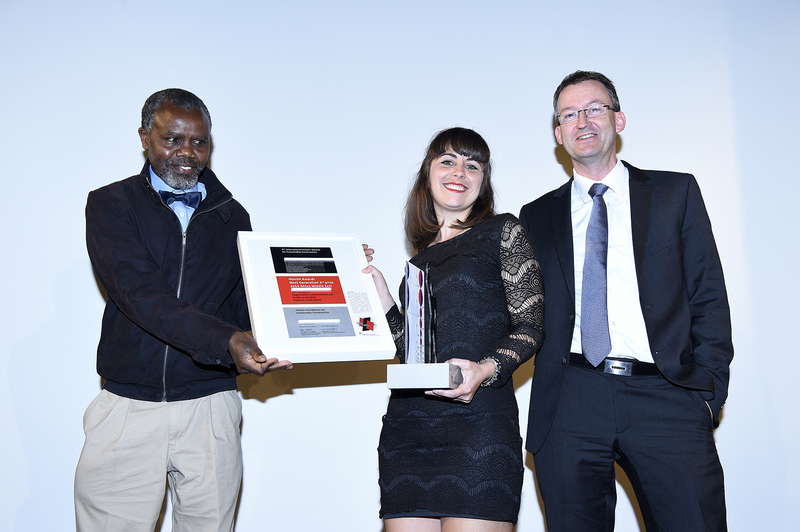 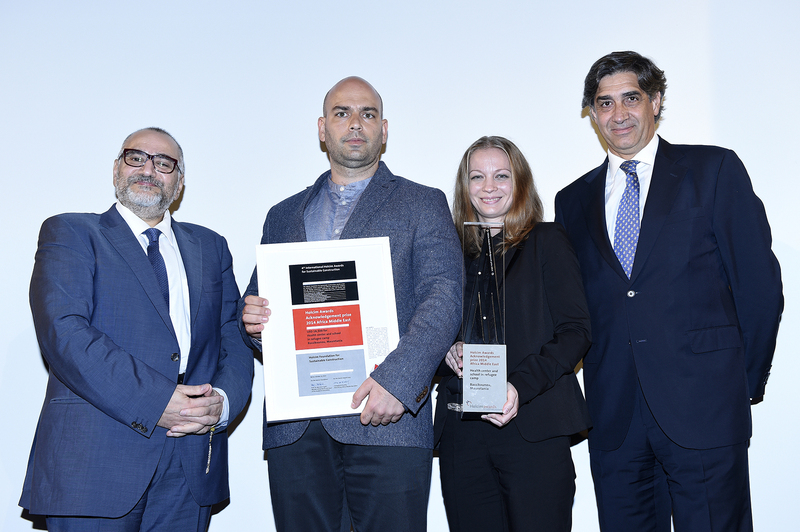 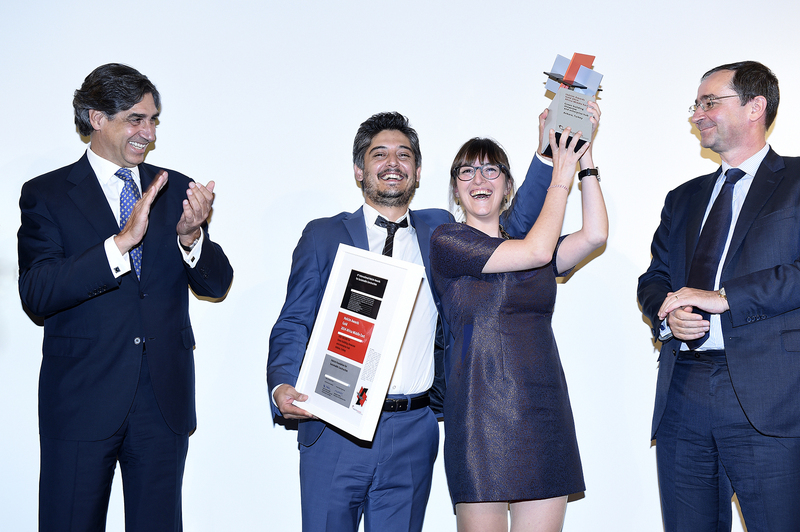 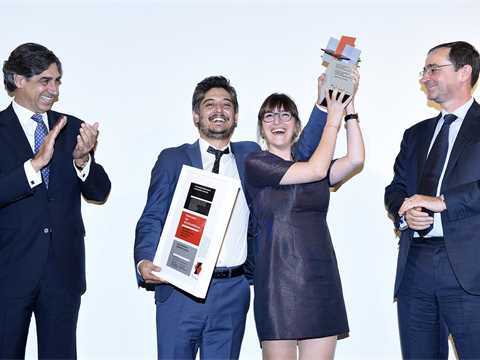 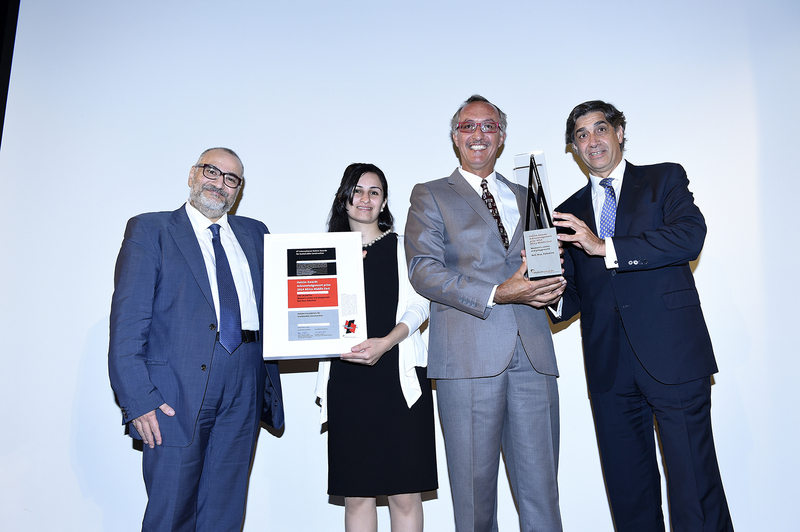 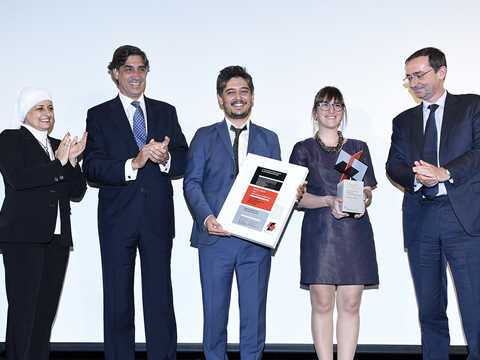 Celebrating the Holcim Awards Gold 2014 winner “Eco-Techno Park: Green building showcase and enterprise hub, Ankara, Turkey” (l-r): Javier de Benito, Area Manager of Holcim for Africa Middle East; winners Onat and Zeynep Öktem, ONZ Architects, Turkey; and Bernard Fontana, CEO of Holcim Ltd. 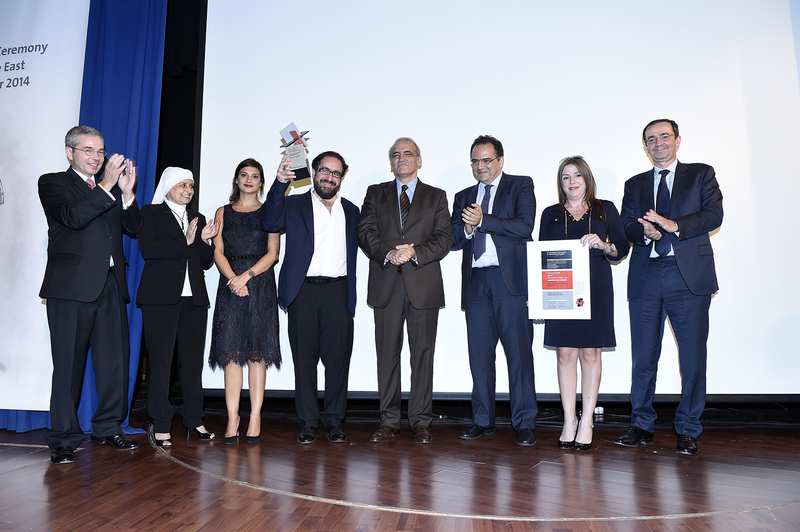 Presentation of the Holcim Awards Silver 2014 in the host city to “Evergreen City: Urban pine forest rehabilitation, Beirut, Lebanon” (l-r): Benedikt Vonnegut, CEO of Holcim Lebanon; Howayda Al-Harithy, Head of the Holcim Awards jury for Africa Middle East and Professor of Architecture, American University of Beirut; winners Yasmina Khalifé, Raëd Abillama, Bilal Hamad, Mayor of the City of Beirut; winners Youssef Abillama, Sawsan Bou Fakhreddine; and Bernard Fontana, CEO of Holcim Ltd. 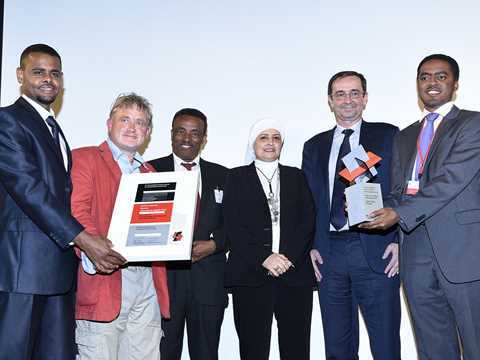 Presentation of the Holcim Awards Bronze 2014 for “Incremental Construction: Low-cost modular housing scheme, Addis Ababa, Ethiopia” (l-r): winners Asgedom Berhe, Dirk Donath, jury members Fasil Giorghis, Chair of Conservation of Urban and Architectural Heritage, Addis Ababa University and Howayda Al-Harithy (head of jury) Professor of Architecture, American University of Beirut; Bernard Fontana, CEO of Holcim Ltd; and winner Brook Haileselassie. 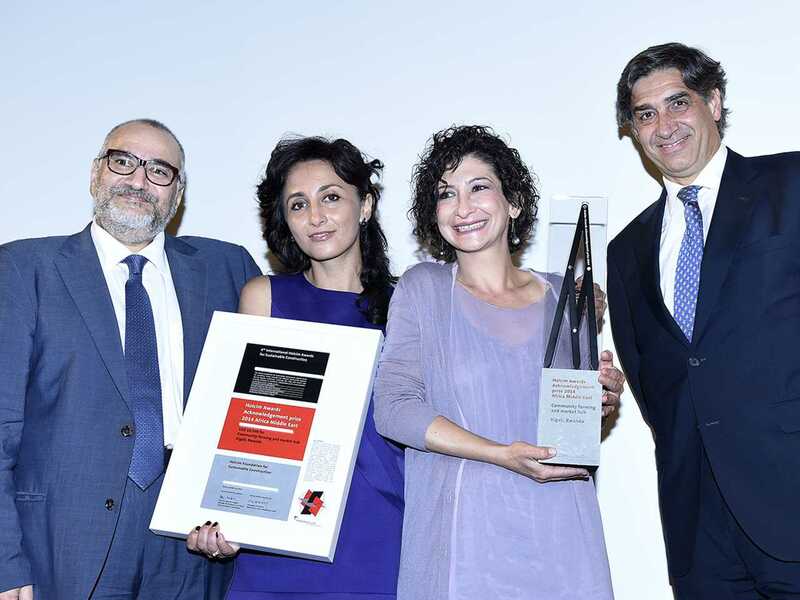 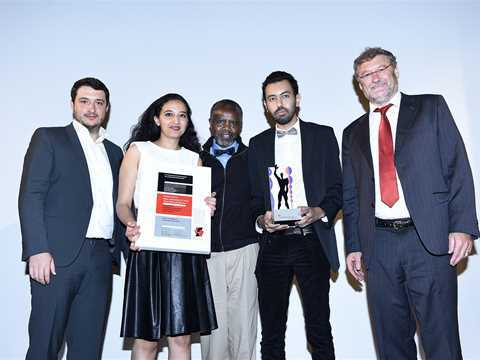 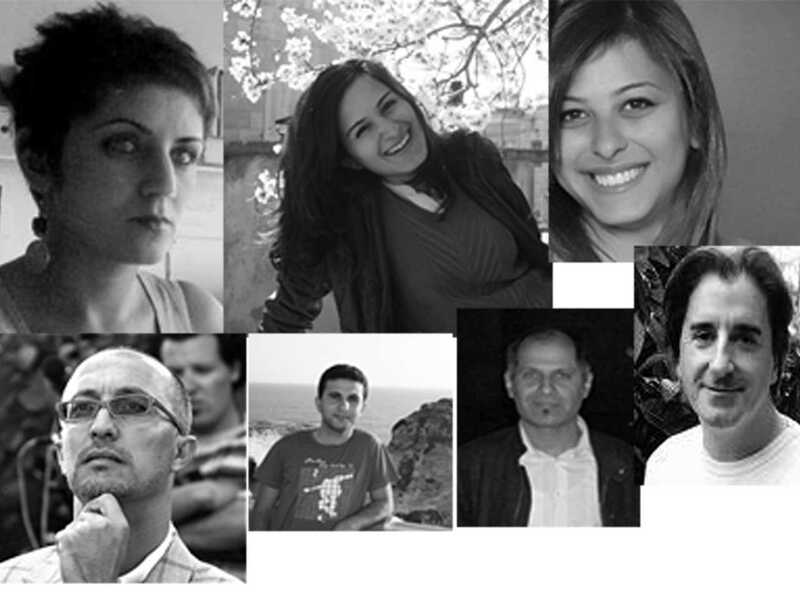 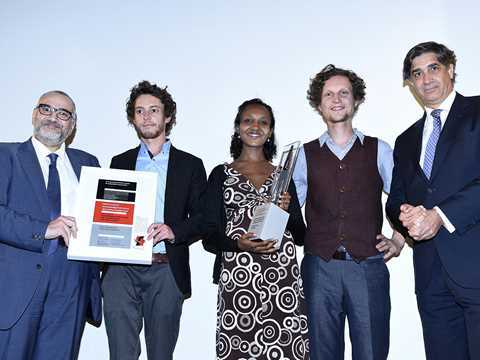 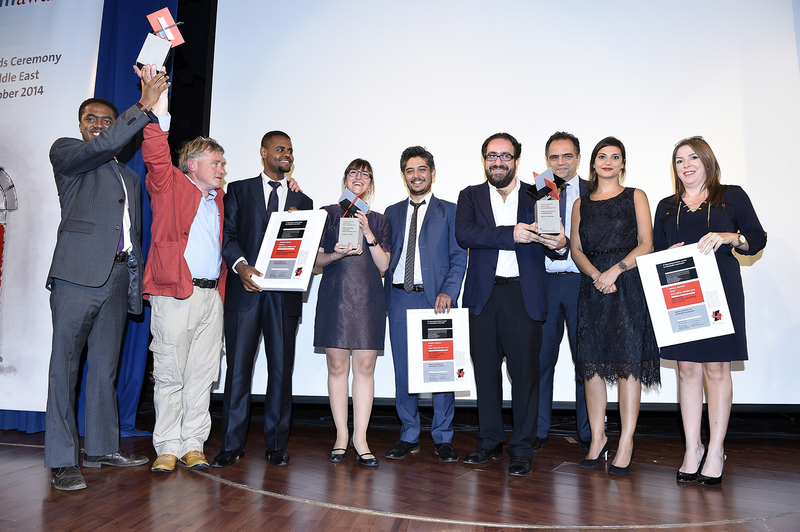 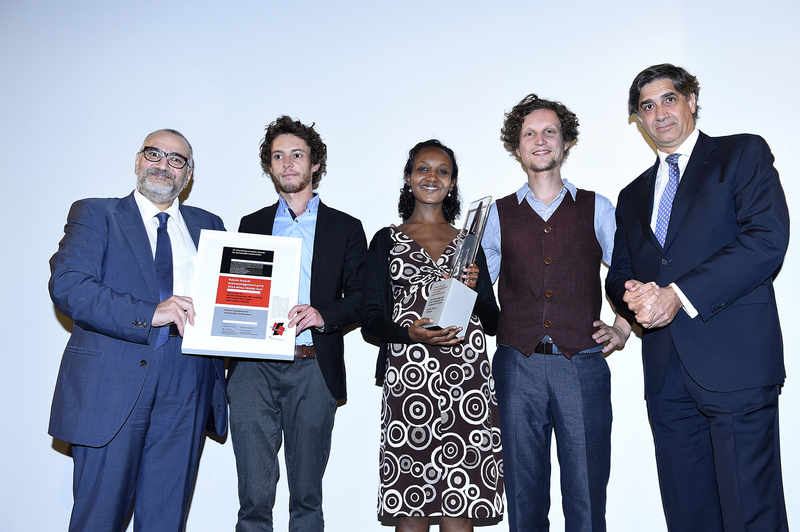 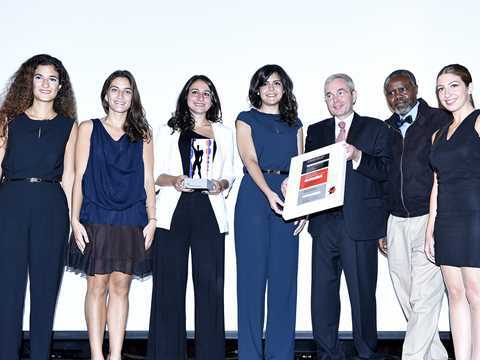 Accolades for all Holcim Awards main prize winners (l-r): Brook Haileselassie, Dirk Donath and Asgedom Berhe (Bronze), Zeynep and Onat Öktem (Gold), and Raëd Abillama, Youssef Abillama, Yasmina Khalifé and Sawsan Bou Fakhreddine (Silver). 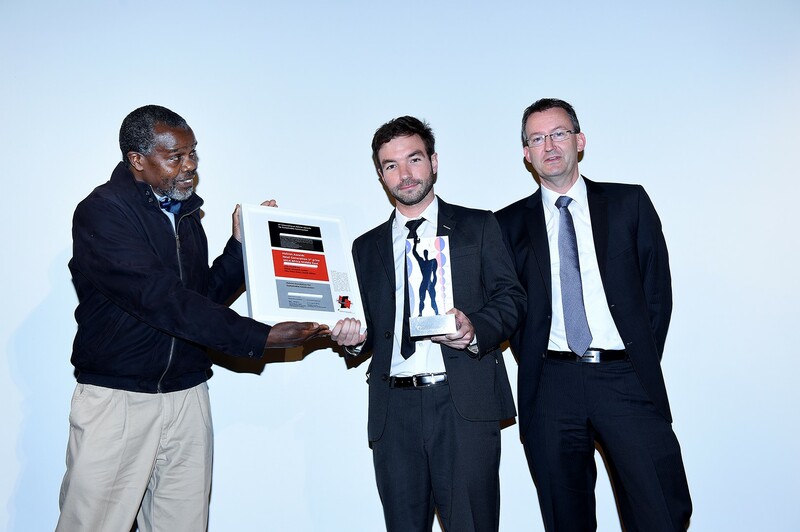 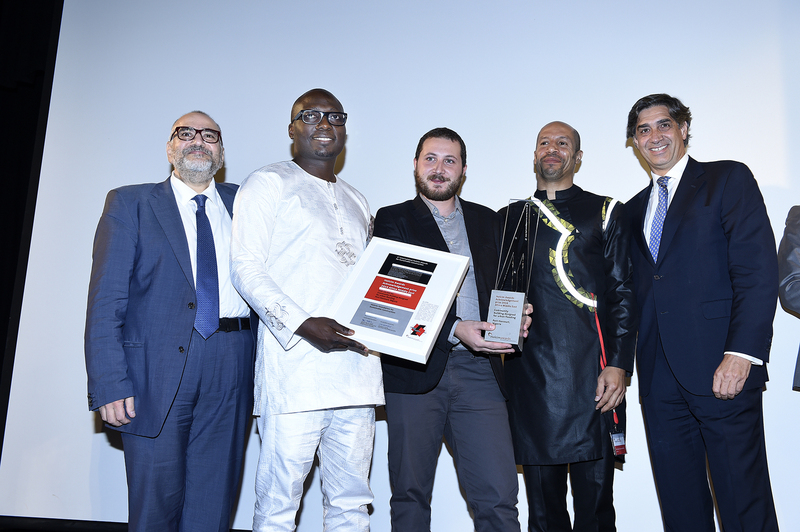 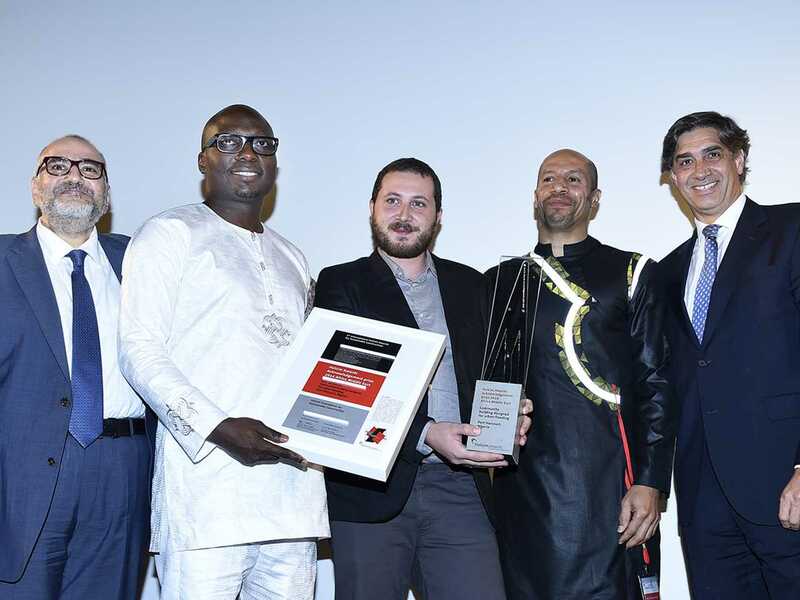 Presentation of the Acknowledgement prize for “Chicoco Radio: Community building designed for urban flooding, Port Harcourt, Nigeria” (l-r): Amer Moustafa, Member of the Holcim Awards jury 2014 Africa Middle East and Associate Dean, School of Architecture and Design American University of Sharjah, United Arab Emirates; winners Kunlé Adeyemi, NLÉ Works, Lagos, Nigeria; Marco Cestarolli, NLÉ Works, Amsterdam, Netherlands and Michael Uwemedimo, CMAP, Port Harcourt, Nigeria; Javier de Benito, Area Manager of Holcim for Africa Middle East. 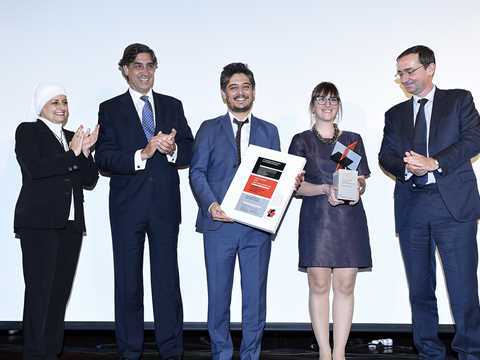 Presentation of the Acknowledgement prize for “Co-op Capacity Building: Community farming and market hub, Kigali, Rwanda” (l-r): Amer Moustafa, Member of the Holcim Awards jury 2014 Africa Middle East and Associate Dean, School of Architecture and Design American University of Sharjah, United Arab Emirates; winners Pamela Larocca, Urban Future organization, Milan, Italy and Costanza La Mantia, Bantu Studio, Johannesburg, South Africa; Javier de Benito, Area Manager of Holcim for Africa Middle East. 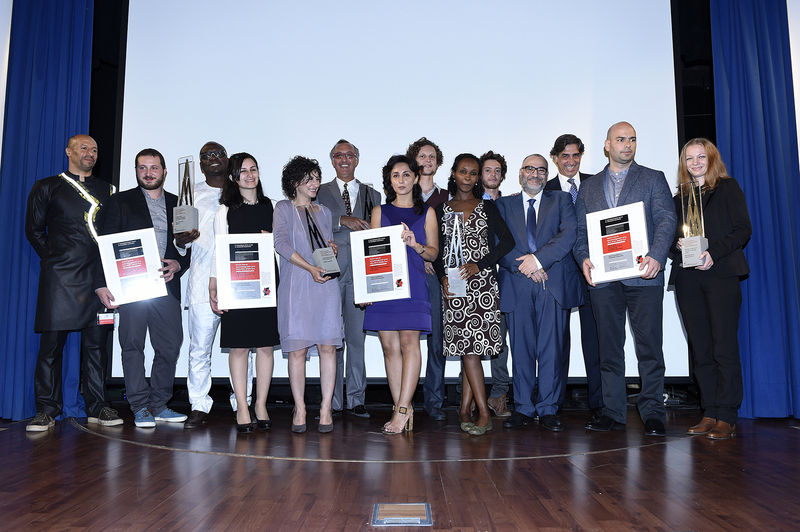 Presentation of the Acknowledgement prize for “Weaving Publicness: Socially-integrated office building with sustainable façade, Addis Ababa, Ethiopia” (l-r): Amer Moustafa, Member of the Holcim Awards jury 2014 Africa Middle East and Associate Dean, School of Architecture and Design American University of Sharjah, United Arab Emirates; winners Wes Degreef, BC architects, Brussels, Belgium; Adeyabeba Tadesse Hailemariam, ABBA architects, Addis Ababa, Ethiopia; and Ken De Cooman, BC architects, Brussels, Belgium; with Javier de Benito, Area Manager of Holcim for Africa Middle East. 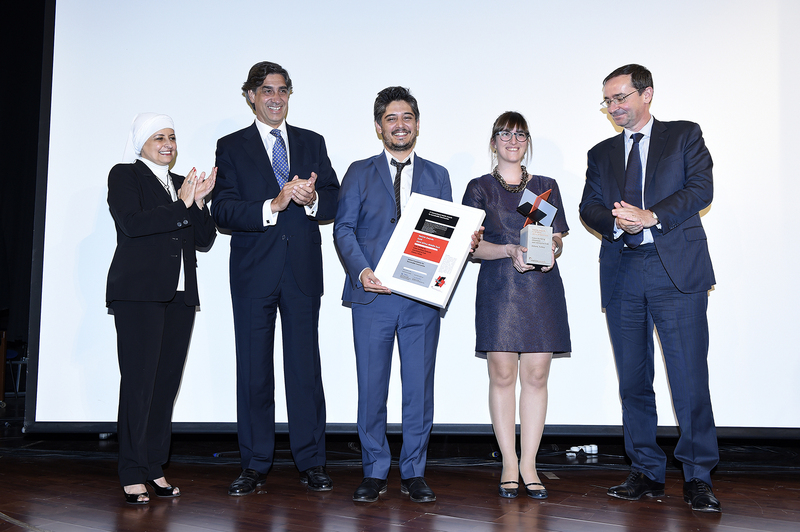 Presentation of the Acknowledgement prize for “White Canvas: Health center and school in refugee camp, Bassikounou, Mauritania” (l-r): Amer Moustafa, Member of the Holcim Awards jury 2014 Africa Middle East and Associate Dean, School of Architecture and Design American University of Sharjah, United Arab Emirates; winners Attila Szabadics and Mónica Rácz, ArchSus Group, Pécs, Hungary; Javier de Benito, Area Manager of Holcim for Africa Middle East. 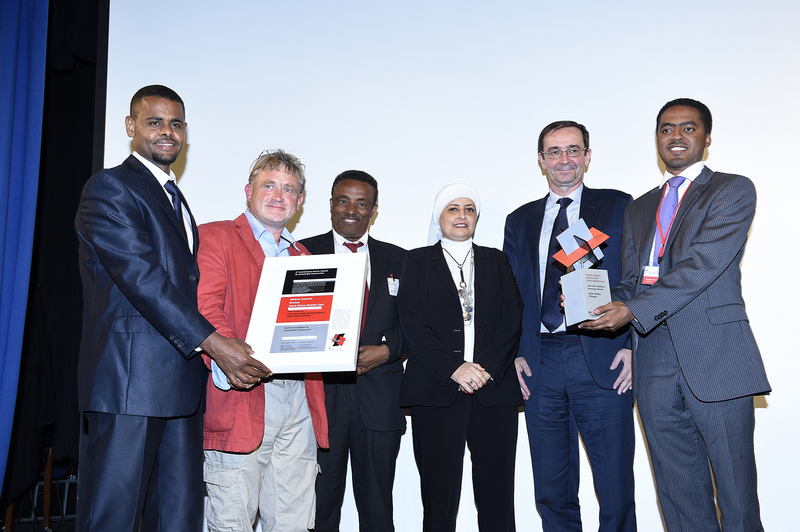 Representatives of all five Holcim Awards Acknowledgement prize-winning teams with projects in Ethiopia, Nigeria, Mauritania, Palestine and Rwanda are congratulated by Amer Moustafa, Member of the Holcim Awards jury 2014 Africa Middle East and Associate Dean, School of Architecture and Design American University of Sharjah, United Arab Emirates (4th from right) and Javier de Benito, Area Manager of Holcim for Africa Middle East (3rd from right). 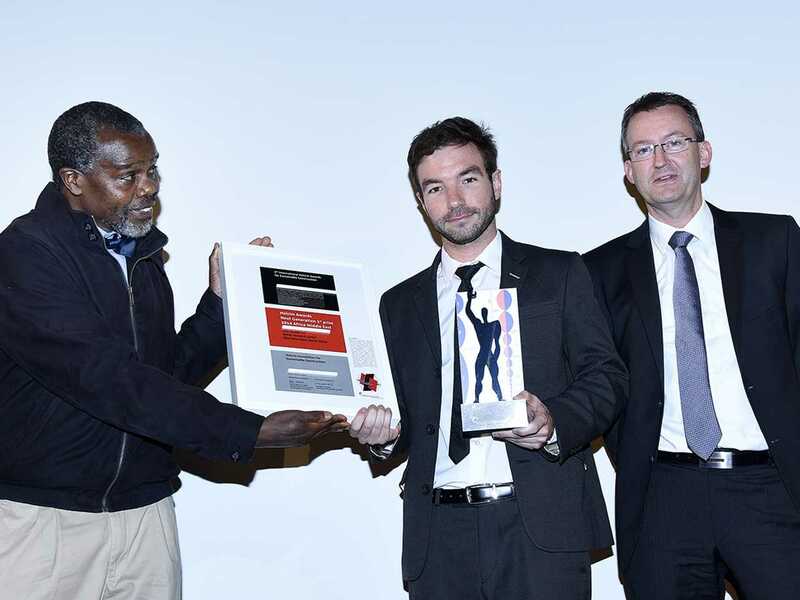 Presentation of the “Next Generation” 1st prize for “Bio-Mimicry: Water research center, Fika Patso Dam, South Africa” (l-r): Daniel Irurah, jury member and Senior Lecturer, School of Architecture & Planning, University of the Witwatersrand, South Africa; winner Jurie Swart, South Africa; and Edward Schwarz, General Manager of the Holcim Foundation, Switzerland. 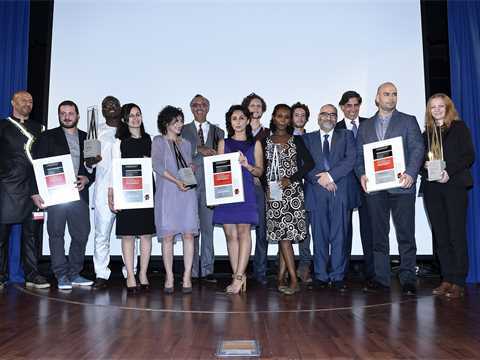 Presentation of the “Next Generation” 2nd prize for “Destroyed City Told: Earthquake memorial and archaeological museum, Agadir, Morocco” (l-r): winners Laurent Sanz and Chamss Doha Oulkadi, BOM architecture, Agadir, Morocco / Paris, France; Daniel Irurah, jury member and Senior Lecturer, School of Architecture & Planning, University of the Witwatersrand, South Africa; winner Mohamed Belhouari; and Dominique Drouet, CEO of Holcim Morocco. 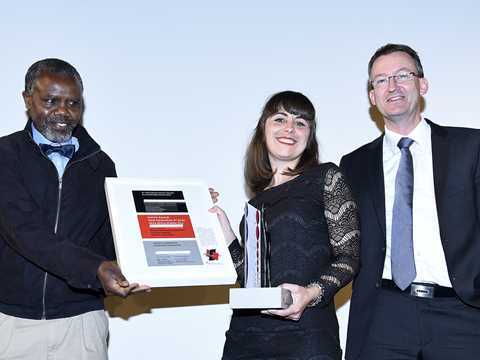 Presentation of the “Next Generation” 3rd prize for “Machinarium: Regenerative urban catalyst and textile production, Pretoria, South Africa” (l-r): Daniel Irurah, jury member and Senior Lecturer, School of Architecture & Planning, University of the Witwatersrand, South Africa; winner Heidi van Eeden, University of Pretoria, South Africa; and Edward Schwarz, General Manager of the Holcim Foundation, Switzerland. 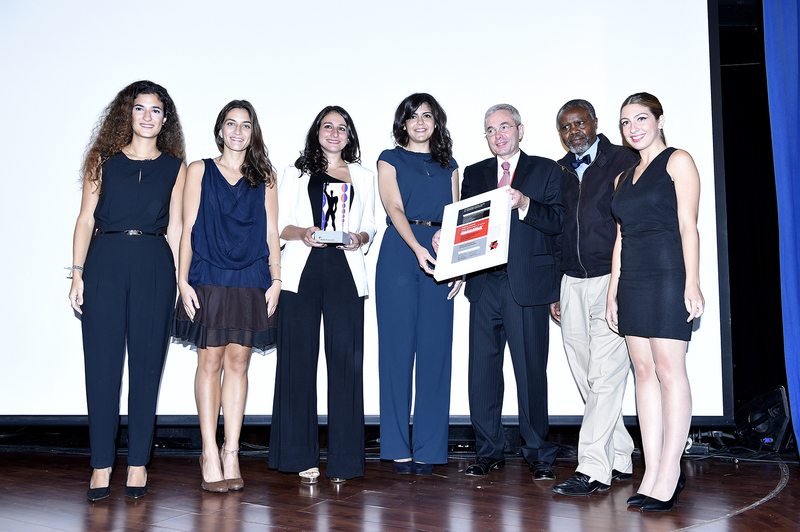 Presentation of the “Next Generation” 4th prize for “Waste to Energy: Urban energy recovery and development concept, Beirut, Lebanon” (l-r): winners Romy El Sayah, Yara Rahme, Marylynn Antaki, Mira Boumatar, all American University of Beirut, Lebanon; Benedikt Vonnegut, CEO of Holcim Lebanon; Daniel Irurah, jury member and Senior Lecturer, School of Architecture & Planning, University of the Witwatersrand, South Africa; and winner Christina Attiyeh, American University of Beirut, Lebanon. 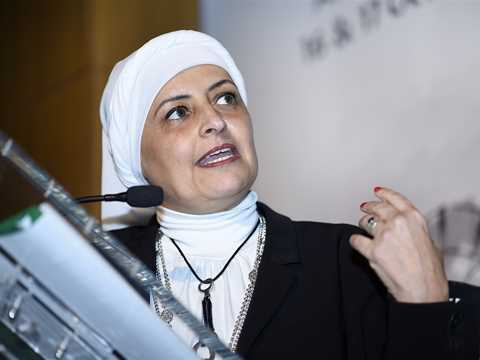 Presenting the Holcim Awards main prize-winning projects: Howayda Al-Harithy, Head of the Holcim Awards jury for Africa Middle East and Professor of Architecture, American University of Beirut. 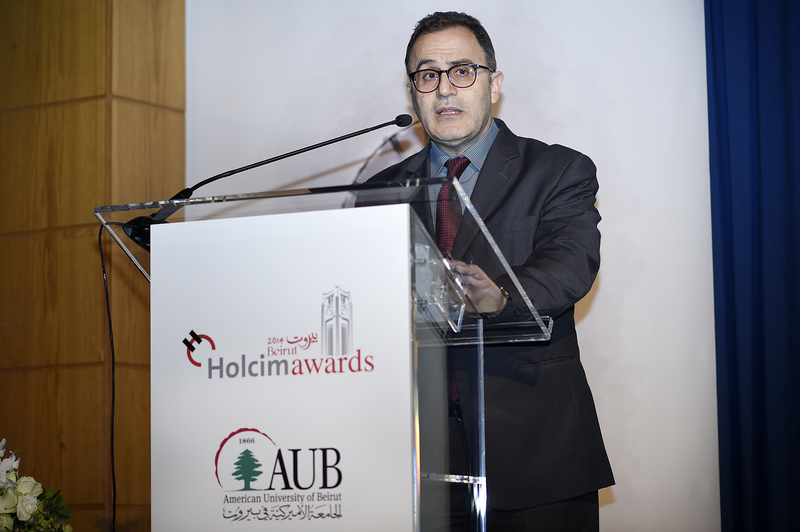 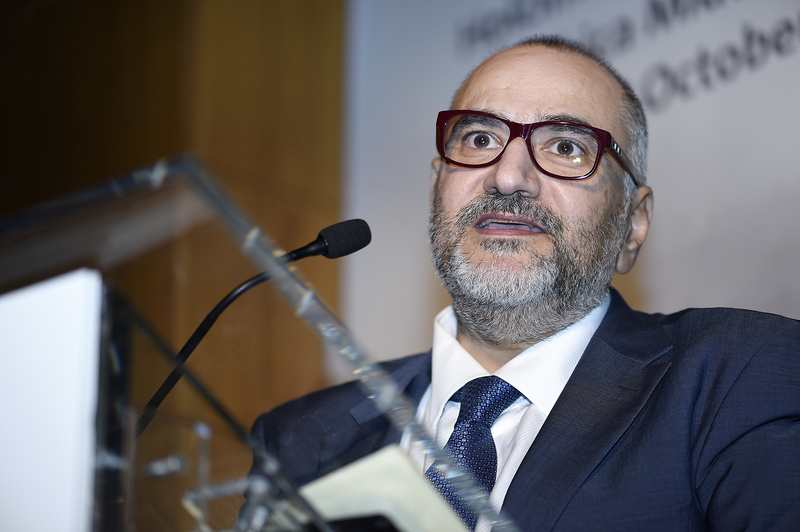 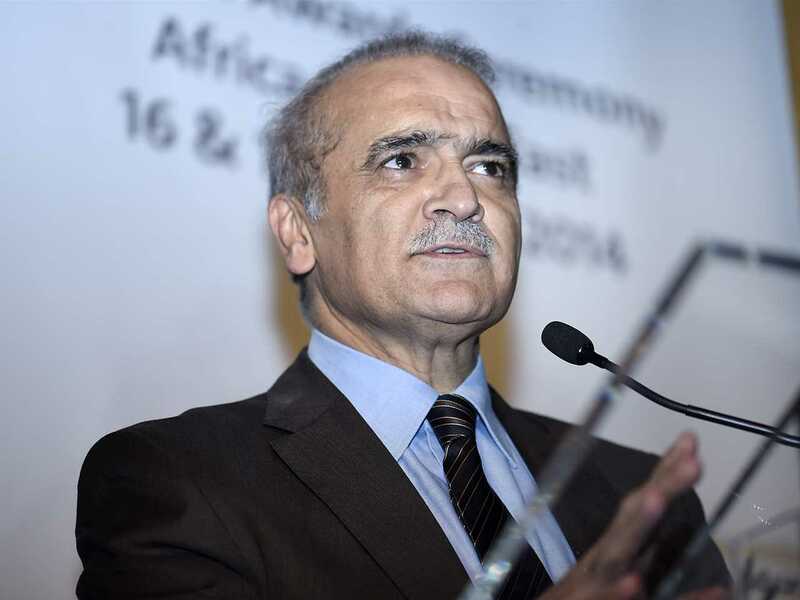 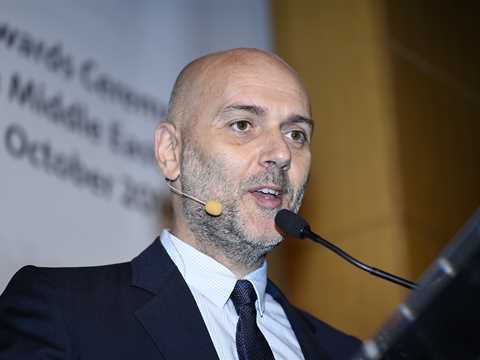 Presenting the Holcim Awards Acknowledgement prize-winning projects: Amer Moustafa, Member of the Holcim Awards jury 2014 Africa Middle East and Associate Dean, School of Architecture and Design American University of Sharjah, United Arab Emirates. 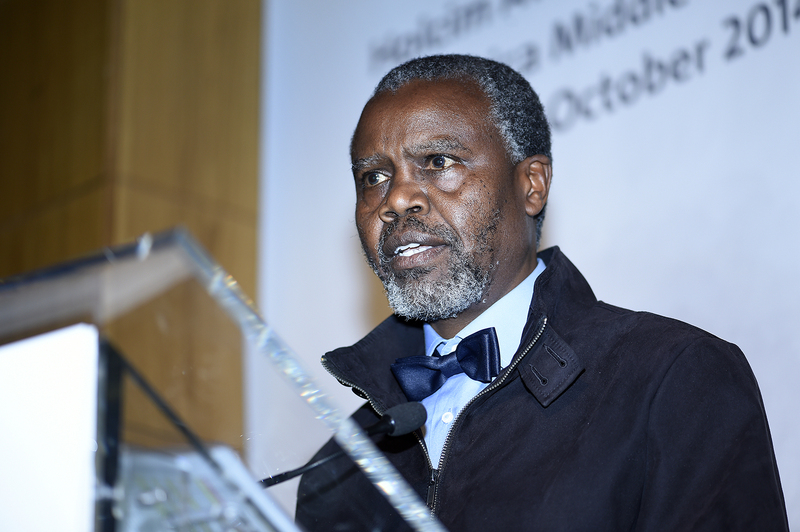 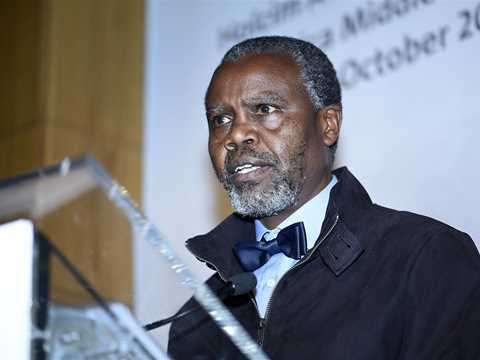 Presenting the “Next Generation” prize-winning projects: Daniel Irurah, Member of the Holcim Awards jury 2014 Africa Middle East and Senior Lecturer, School of Architecture and Planning University of the Witwatersrand, Johannesburg, South Africa. 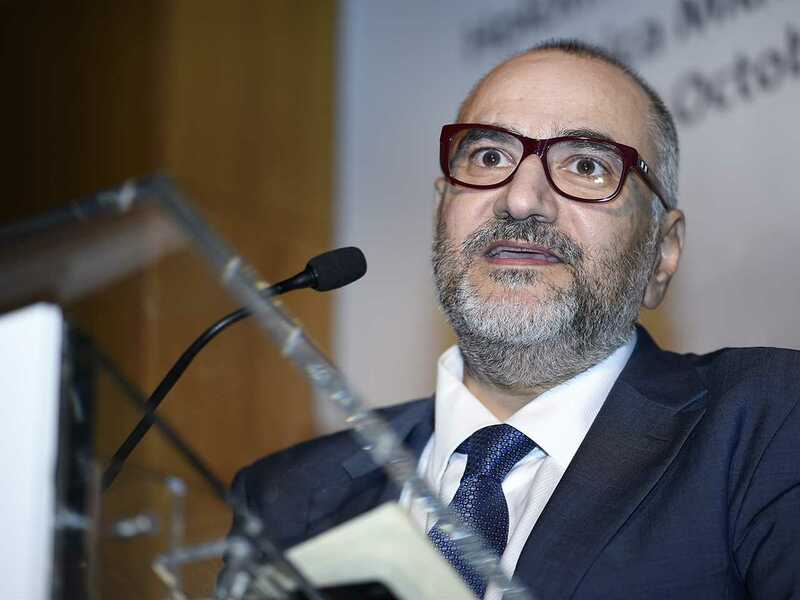 “How do we make the city sustainable and smart?” Bilal Hamad, Mayor of the City of Beirut, Lebanon. 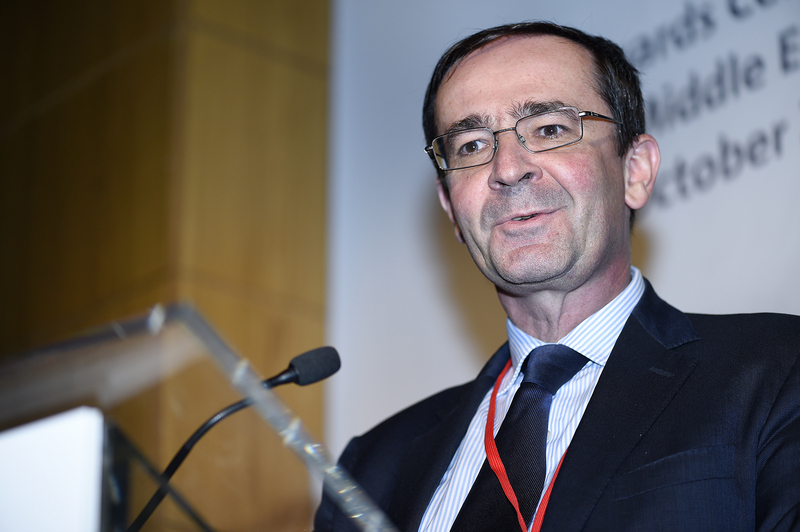 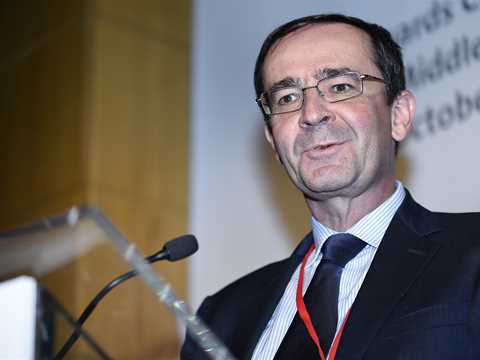 Bernard Fontana, CEO of Holcim Ltd and Chairman of the Steering Committee of the Holcim Foundation, Switzerland. 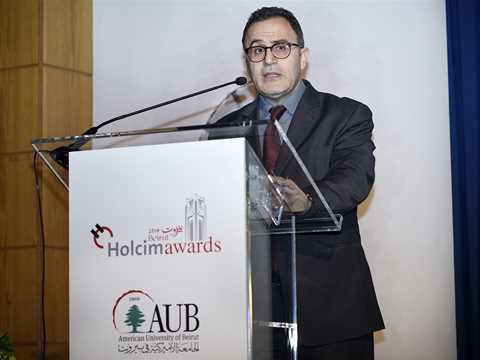 Welcoming more than 200 guests to the AUB campus, Ahmad Dallal, Provost of the American University of Beirut (AUB), Lebanon. 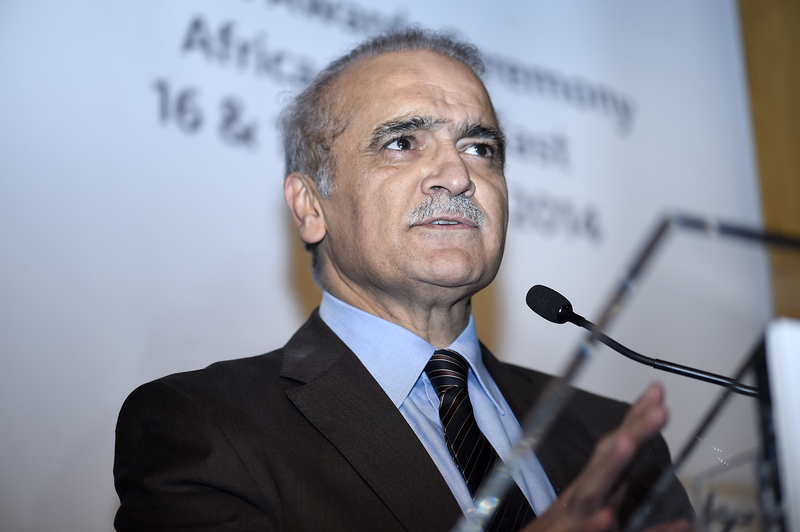 Master of ceremonies: Ricardo Karam, TV Talkshow Host. 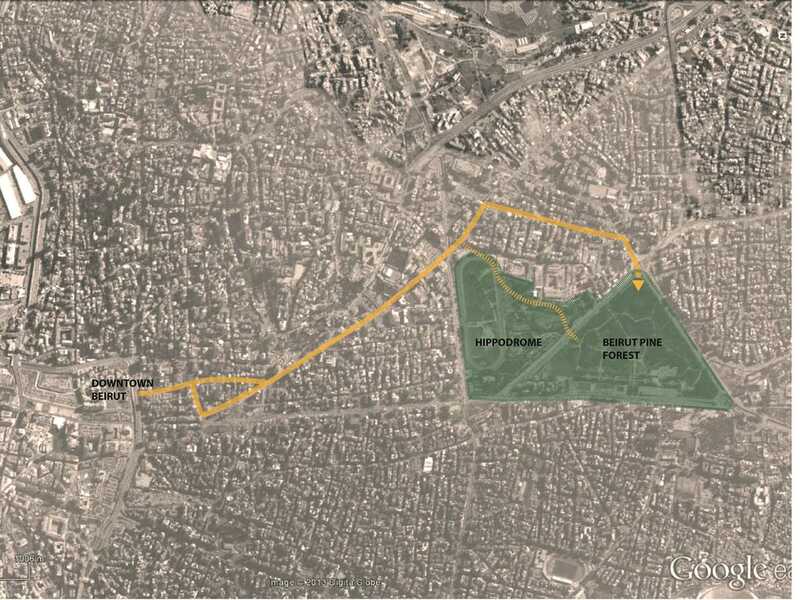 The Beirut Pine Forest is centrally located in the city and can be easily accessible through main roads. It is surrounded by different functions such as residential, office, educational, cultural, and religious precincts. 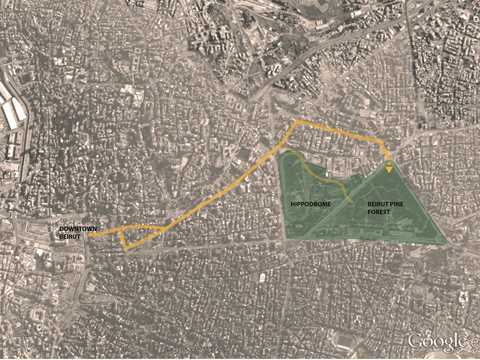 Softscape, an urban project starting from Downtown Beirut will have the Beirut Pine Forest as its final stop. The project is situated in an area earmarked for total renewal in a typical neighborhood of Addis Ababa, one of the fastest-growing cities in Africa. New constructions in the city predominantly use concrete frame and cast in-situ construction; and the city has banned natural materials from being used in buildings since 2009, limiting the solutions available for house construction. It aimed to investigate possibilities for an alternative urban housing unit in this context. 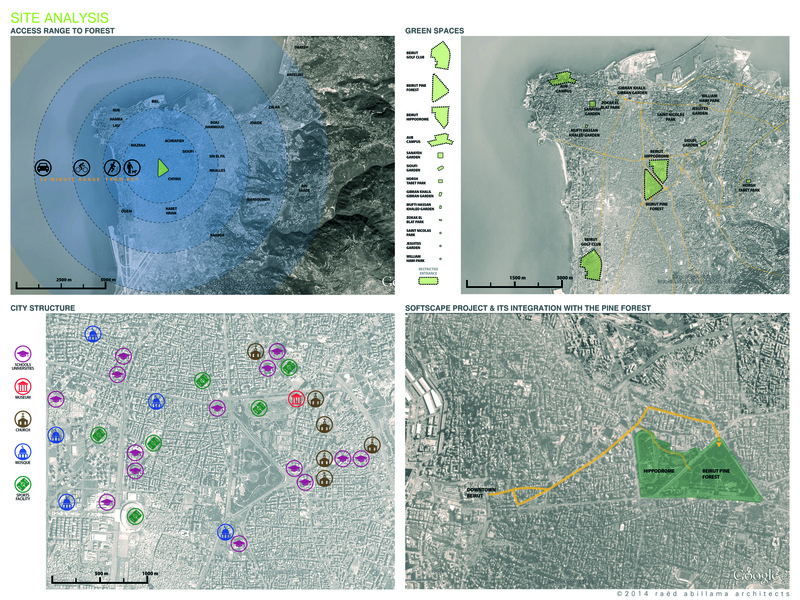 This project explores whether nature and architecture can amalgamate to become a hybrid solution in a vast landscape which has lost its reference to place and time. 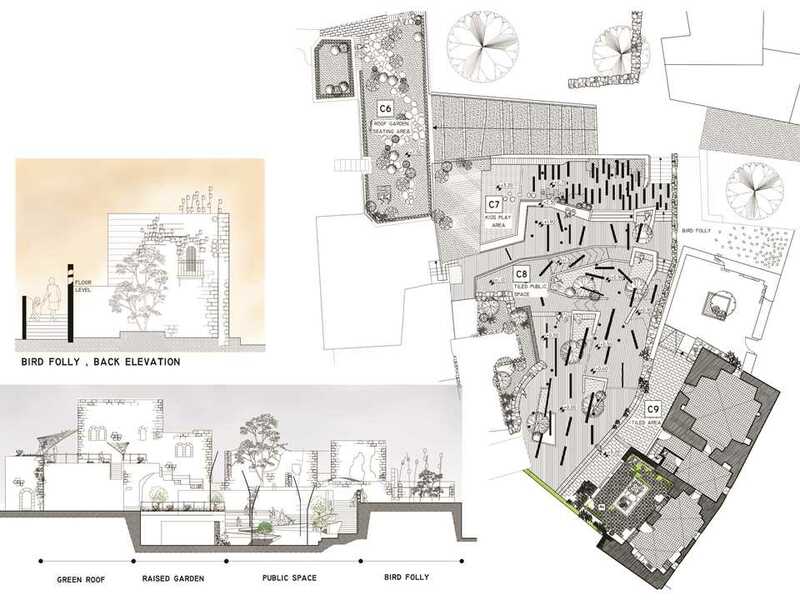 The transformation of place and time through architecture results in a progressive fusion giving meaning to a certain non-place lacking character and spatial qualities and resulting in an awakened space. This led to the idea of spatial reawakening through the medium of architecture. Shatha Safi of Riwaq Center for Architectural Conservation, Palestine and Yara Sharif of NG Architects and Palestine Regeneration Team, United Kingdom received one of the five equally-ranked Acknowledgement prizes for a women’s center and playground in Palestine that creates social and physical infrastructure for cooking, education and gardening as a conduit to empowering women in the community. 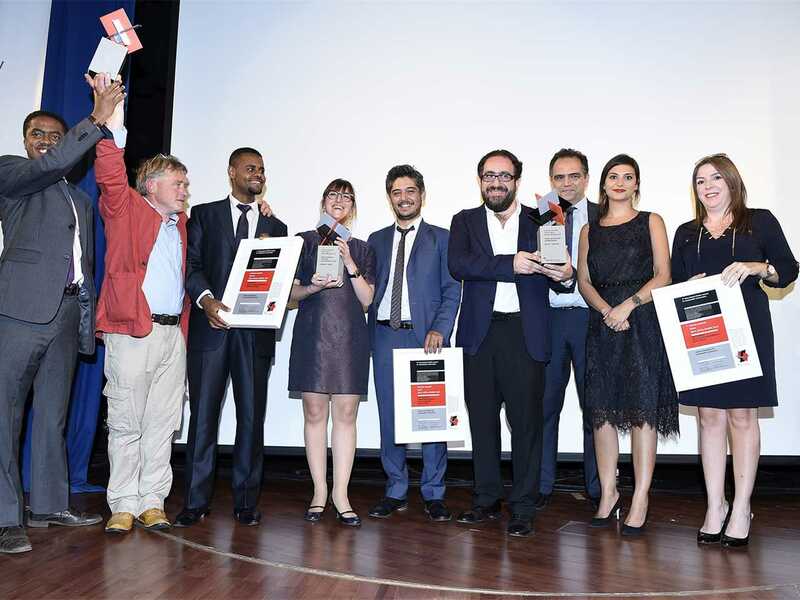 The jury greatly appreciates the project’s social and spatial initiatives to strengthen communities and their environment in a politically troubled region of the world. Specifically valued is the intention to rehabilitate a historic site with minimal means and to revitalize a community through the provision of facilities for important daily activities – cooking, playing, gardening, etc. 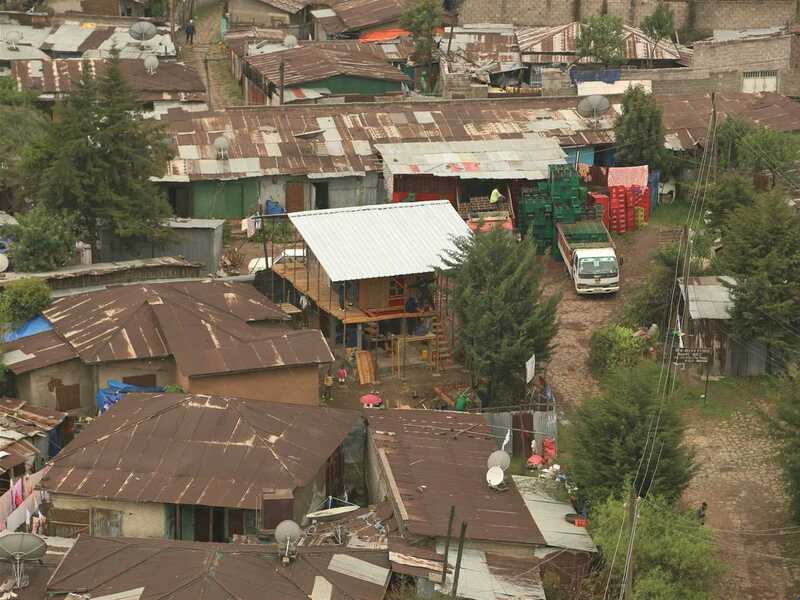 At the core of the project is the build-up of social and physical infrastructure – understood as a conduit to empower local stakeholders and, most importantly, families and women of all ages. Part of a larger scheme to revive the historic center of Beit Iksa, a small Palestinian village of 1,600 people near Jerusalem, the project offers a response to the village’s isolation and limited resources. 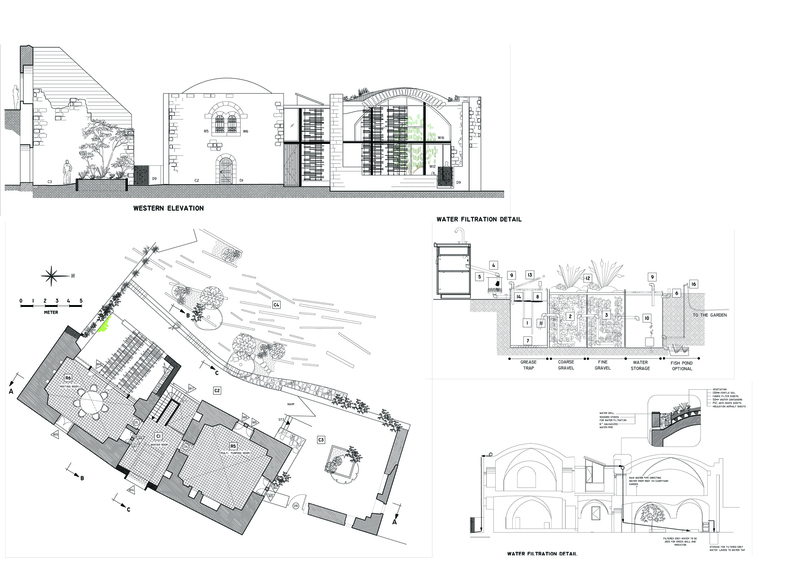 In a first step, two abandoned buildings will be adapted for reuse as working spaces with an eco-kitchen for the local women’s association, followed by the rehabilitation of surrounding spaces. 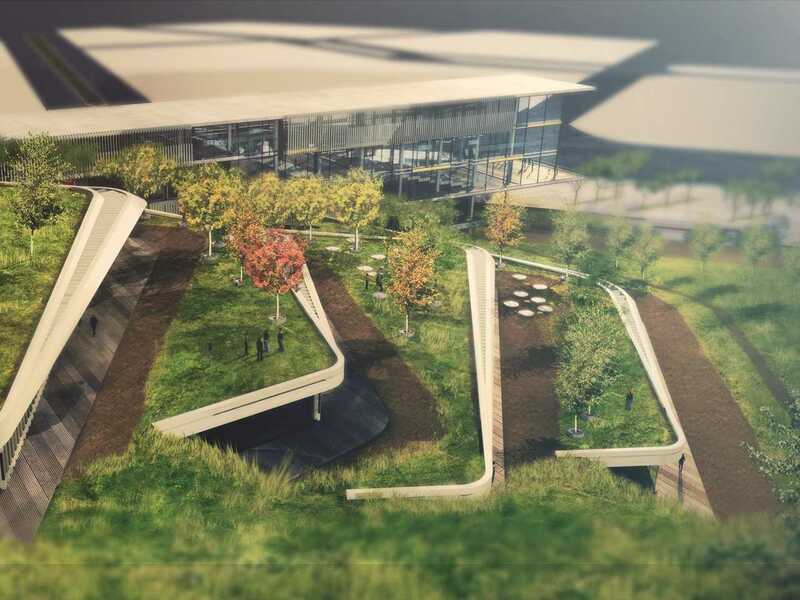 The new facilities will include interactive educational playgrounds for children, winter and summer seating areas, and a protected bird habitat. It is an effort to bring life back to this abandoned site by combining design, planning, restoration, landscaping, and infrastructure, thus improving local living conditions and biodiversity, while adding to the aesthetic quality of Beit Iksa. This project is based on respect, admiration and belief in the historic built environment. It is an effort to bring life back by combining design, planning, restoration, landscaping and infrastructure. 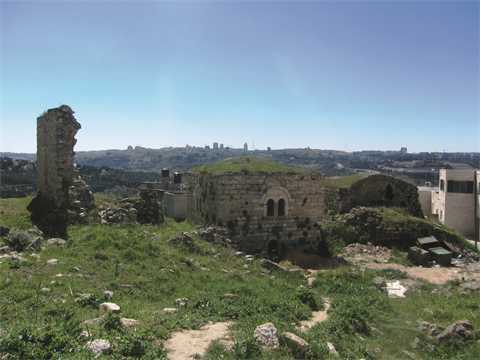 It is to reveal the forgotten beauty of Beit Iksa and to add few contemporary elements that make it more appealing to current needs. 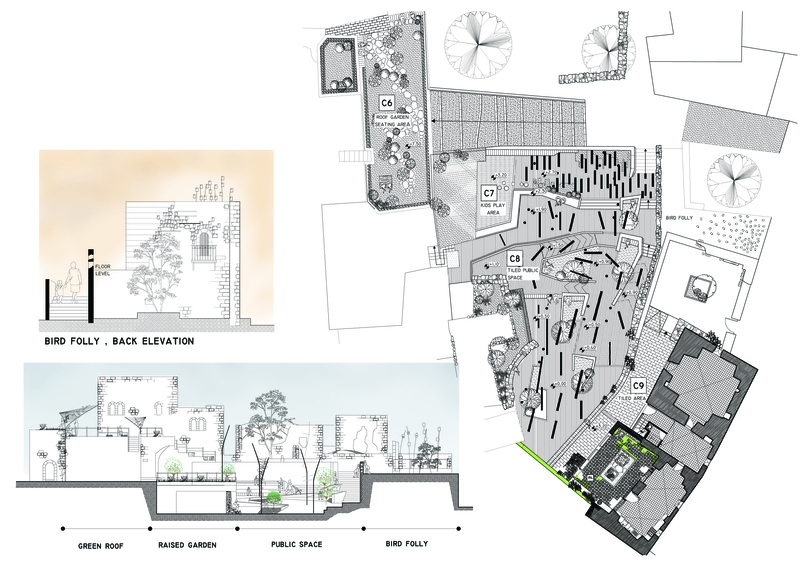 New functions, shaded landscape, and open space will create a platform for meeting and learning. The new facilities will include an environmental play-area for children, eco-kitchen for women, winter and summer seating areas, and a protected bird habitat area, thus improving local living conditions and biodiversity – as well as contributing to the aesthetic quality of Beit Iksa. 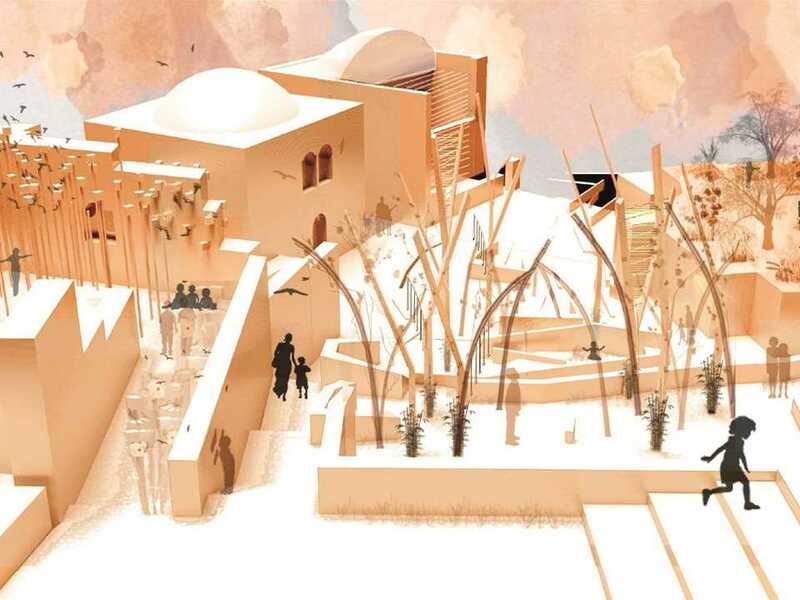 This initiative is part of a learning lab for ongoing and future regeneration projects of Riwaq Centre for Architectural Conservation (Riwaq). In 2009 Riwaq set a goal to rehabilitate 50 historic centers, Beit Iksa is “number nine”. 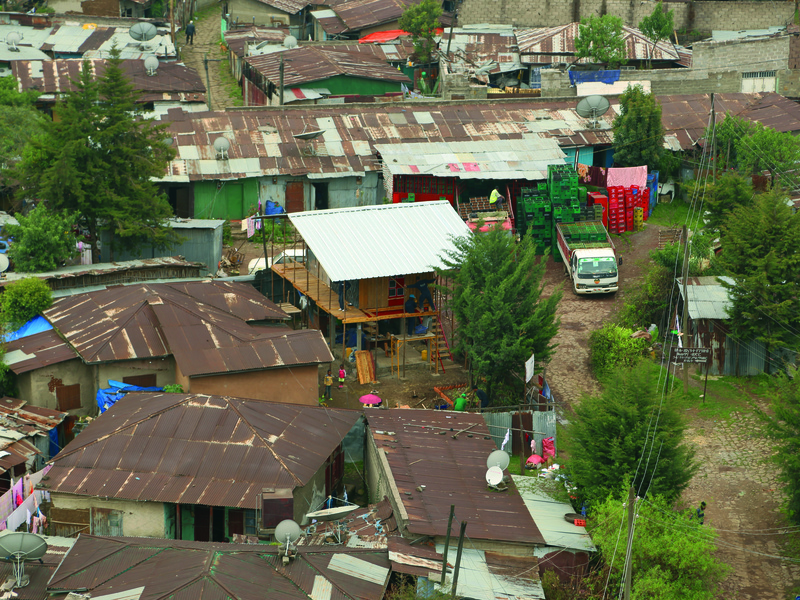 Newly introduced measures such as green roofs, grey water filtration, and passive heating and cooling, capitalize on local resources and minimize waste. 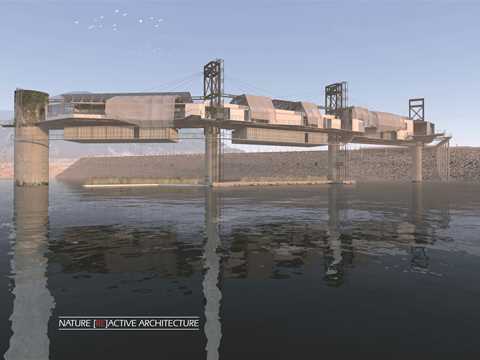 These were tested and are implemented in the project with a plan to learn and replicate. The project team will be involved with the community for the next two years, and has plans to publish a booklet and showcase the project on their website. 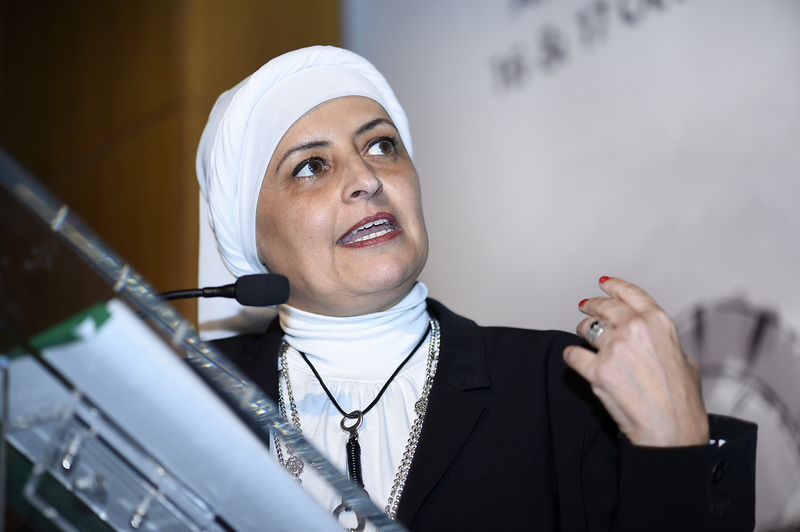 The project is based on a year-long process with the community prior to its implementation. 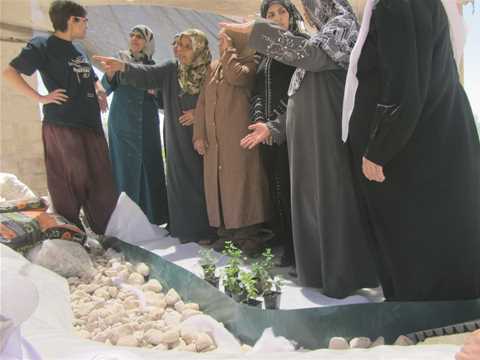 Women led the way in the training on grey water and green roof installation. 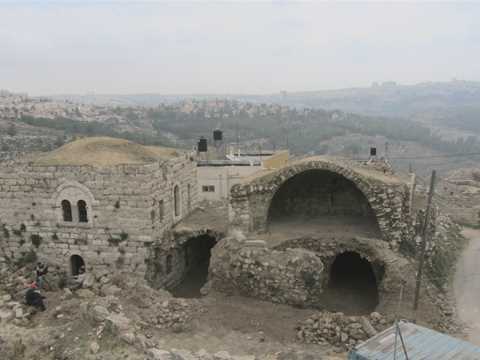 The building itself has been leased free-of-charge to the women for 12 years. 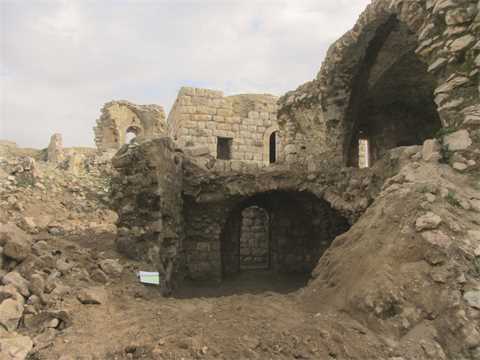 Local landlords offered the surrounding spaces for communal use. 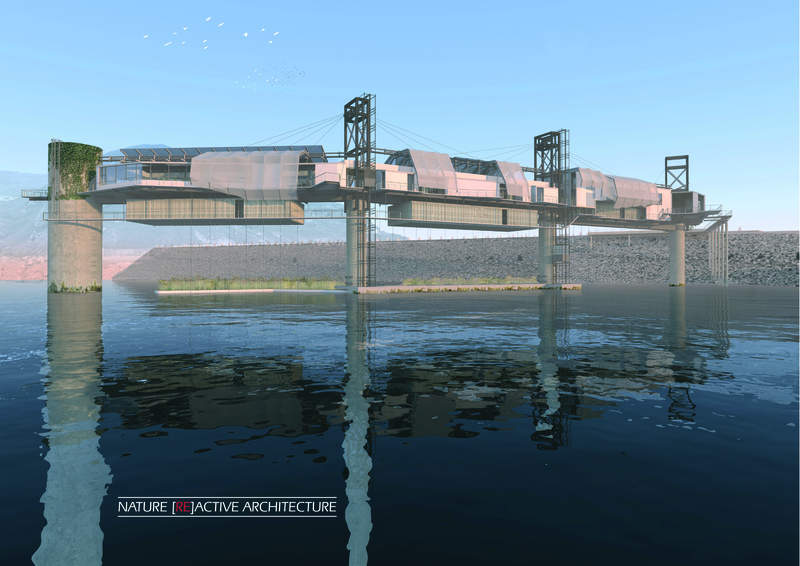 The project is based on local knowledge in construction, combining high-tech features using low-tech means. Traditional building materials on site are recycled. 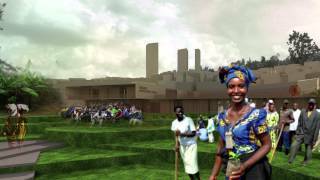 Rammed earth and gabion wall techniques were tested as alternatives to concrete. 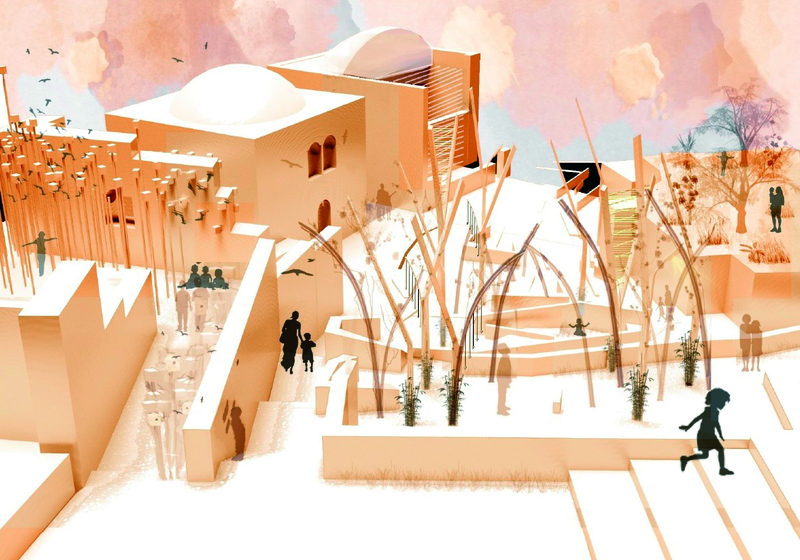 Since Palestine is one of the busiest corridors for bird migration in the world, hosting around 500 million birds every season, and Beit Iksa is located along the bird route – part of the project is a decorative bird folly that provides a nesting and rest-area. 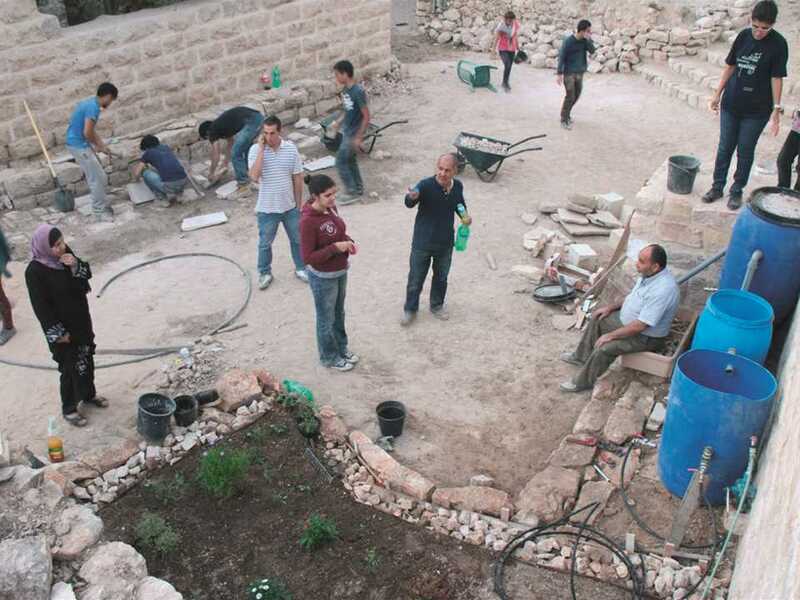 The project is a collective effort; Riwaq initiated and fund-raised for the project, the community contributed from its own resources, individuals offered their properties, and the Village Council offered public works. 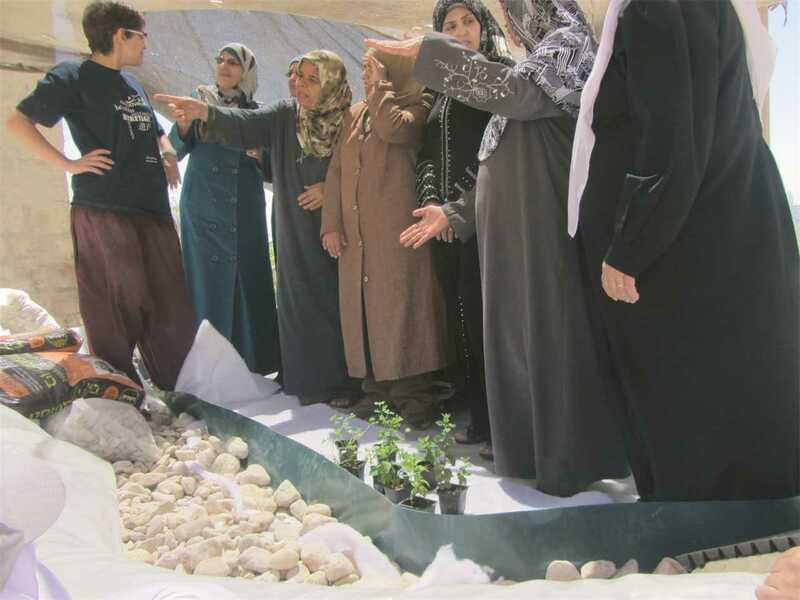 Once completed, the eco-kitchen will support 35 women bread-winners, contributing to long-term economic and social life through the reclamation of the historic space and reintroduction of communal practices.